On a random Saturday night in March 1987, Kurt Cobain—along with his friends Krist Novoselic and Aaron Burckhard—loaded up in a borrowed panel van and drove half an hour south of their Aberdeen, Washington hometown. The destination? 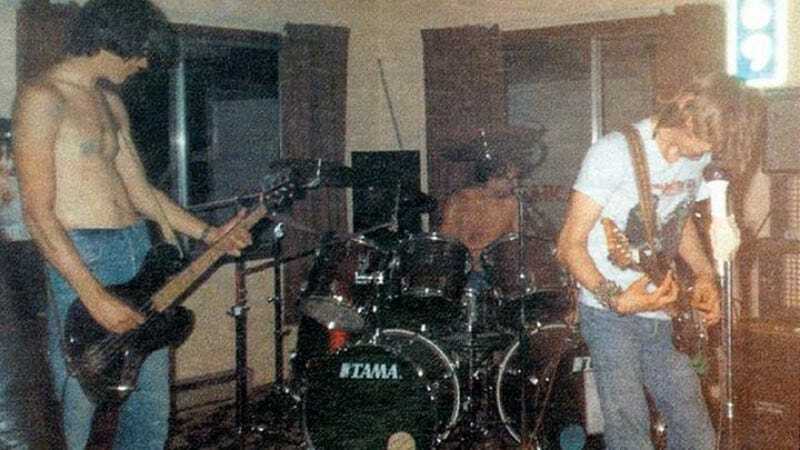 Their first-ever gig together as Nirvana, in the basement of some dude’s house. One of the home’s residents, Tony Poukkula, was in a band called Laytem at the time, and joined in for a few numbers on guitar. He also had some pictures taken, which he kept hidden away in his library for decades—until his 19-year-old daughter Maggie happened upon them recently and shared them with the world over Twitter. The performance itself that night was a near-complete disaster. The audience, while not outright hostile, sat on their hands for most of the show as the fledgling outfit worked through harried original numbers like “Aero Zeppelin” and “Hairspray Queen” and snippets of well-known covers, including a bit of Simon & Garfunkel’s “The Sound of Silence.” Cobain himself was particularly disappointed with how he and his band were received, and set his guitar down and walked out the door about an hour in. It would be another two months before they played as Nirvana before a live audience again.